Dorotha Braddock must have been adopted by William Coller. 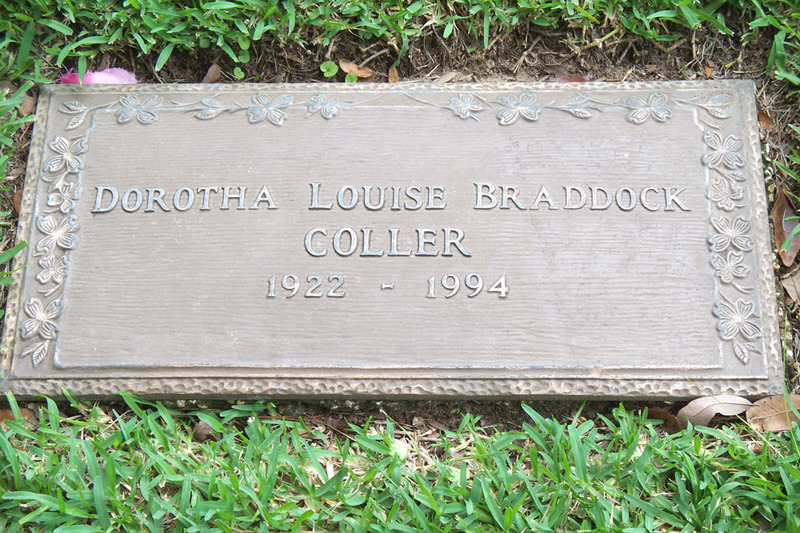 Her name on her tombstone is Dorotha Louise Braddock Coller. From a 1994 edition of the Owosso Argus-Press. Age 71, of New York City and formerly of Owosso died Jan. 3, 1994, from a massive heart attack in her apartment. Her remains were cremated per her wishes and shall be interred in the Highland Memorial Park Cemetery, Ocala, Fla.
Ms. Coller was born in Orlando, Fla. on July 20, 1922, the daughter of Archie G. Braddock and former Owosso High School English teacher, Hazelle Braddock Coller. She spent her early life in Wayland, Mich. and Owosso, graduating from Owosso High School with the Class of 1939. After a year or two at Michigan State University, she moved to New York City where she spent the rest of her life. She was predeceased by her mother and stepfather, William M. Coller, who died in 1985 and 1975, respectively. 1. Cemetery: Highland Memorial Cemetery: Ocala, Marion County, Florida.